Contrary to expectations, total joint arthroplasty (TJA) for hip or knee osteoarthritis does not necessarily lead to weight loss, according to a systematic review performed by researchers in San Diego. Total joint procedures have been consistently associated with pain relief in the medical literature. Because osteoarthritis patients often report that pain prevents them from exercising, it seems logical that symptom improvement after TJA would enable patients to exercise more, which in turn would lead to weight loss. But that wasn’t confirmed by the 12-study systematic review, which was e-published in September by Clinical Orthopaedics and Related Research. Thanks to design limitations in the studies analyzed and high variability of the weight-related outcomes reported, the review found no conclusive evidence that patient weight decreases after TJA—or, for that matter, that it increases or remains the same. Researchers from the University of California San Diego (UCSD) reviewed one case-cohort study and 11 case series in which weight change was assessed after TJA for hip or knee osteoarthritis. None of the studies mentioned any type of weight-loss intervention or advice given to patients after surgery. When the 12 studies were analyzed broadly, the proportion of patients who lost weight at least one year after TJA ranged from 14% to 49%. In the five studies that specifically looked for a clinically meaningful weight change of 5% or more, only 11% to 17% of patients lost weight within the study follow-up time. 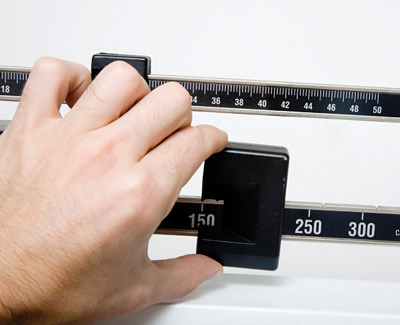 Overall, no meaningful conclusions regarding weight change could be drawn. The variability of the reported findings suggests that specific subgroups of patients may respond to surgery in different ways, said Maria C.S. Inacio, MS, a graduate student in the Joint Doctoral Program in Epidemiology at San Diego State University and UCSD, and first author of the review. One challenge of analyzing the existing literature on this topic is that weight change is typically not a primary focus for studies on TJA. It will, however, be the primary focus for Inacio’s doctoral dissertation, which she hopes will address some of the technical and statistical limitations of the studies analyzed in the review. Some key limitations of previous studies include a lack of strict inclusion criteria and statistical analysis of weight-related measures as independent observations rather than paired observations, Inacio said. The results of the review are also consistent with those of a study published earlier this year by researchers from St. Paul Hospital in Vancouver, BC, in which body mass index (BMI) did not change significantly following ankle reconstruction in overweight and obese patients despite significant symptom improvement (see “Study finds no decrease in BMI after ankle surgery despite functional gains,” May, page 15). In that study, 21% of 107 patients had gained one or more units of BMI two years after surgery while 24% of patients had lost one or more units. At five years, 33% of 57 patients available for follow up had gained one or more units while 33% had lost one or more units. As a group, patient function improved significantly from baseline to five years as measured using the Ankle Osteoarthritis Scale and Short Form-36 Physical Component Summary. However, those scores remained significantly different from normal levels despite the improvement. Penner MJ, Pakzad H, Younger A, Wing KJ. Mean BMI of overweight and obese patients does not decrease after successful ankle reconstruction. J Bone Joint Surg Am 2012;94:e57.